You can make the music video fill your entire screen, by pressing the little box at the bottom right corner of the video box. 302 people in our community are currently praying with you. A pretty baptism song for country music fans. this day I entrust my soul, my relatives, my benefactors, my friends and enemies, and all who confess your holy name. He had sent Judah ahead of him to Joseph to show the way before him in Goshen, and they came into the land of Goshen. Then Joseph prepared his chariot and went up to meet Israel his father in Goshen. He presented himself to him and fell on his neck and wept on his neck a good while. Jacob had thought both of his sons by the true wife of his heart, Rachel, had died; but now, the bitterness of his life has been replaced by joy, for not only are they both alive, but Joseph has provided the means for his entire clan to survive the great famine. Notice that it is Judah who is sent ahead. 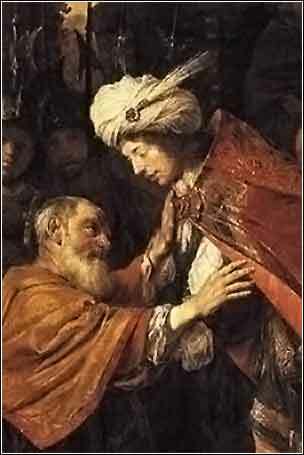 Reuben, not Judah, is the eldest son; Judah is actually the fourth-born. But if you read carefully, you will notice that Judah takes the forefront much of the time. He seems to be the natural leader and, in fact, his descendants, the tribe of Judah, will become the greatest of all the tribes of Israel. The tribe of Judah will be the home of Jerusalem and the tribe of King David; thus, it is the tribe of Jesus. Moreover, although the unified kingdom was called "Israel" in honor of Jacob's alternative name, the Kingdom of Judah was always preeminent — larger, richer, and more inclined to keep God's commandments. After Solomon's death and the kingdom split, "Judah" embodied Hebrew faith and independence as the northern Kingdom of Israel became corrupt and weak. The Romans called their province Judea, after Judah. But Israel became the catchword for the Jewish homeland after the diaspora, in honor of Jacob's name. Jacob and Joseph Reunited, artist unk.